Let’s focus on getting as much advancements and merit badges completed as possible on Tuesday. I know of two scouts that need scoutmaster conferences already. 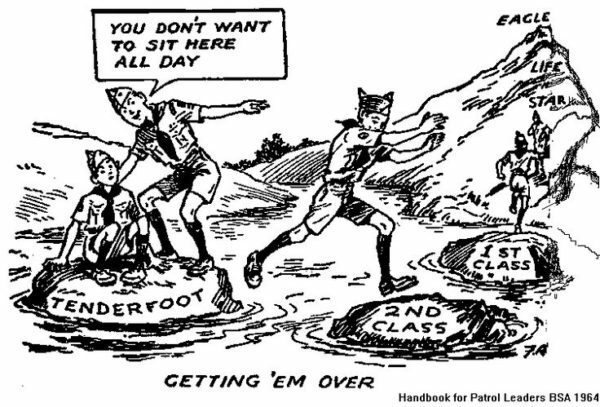 All those that went to summer camp last summer should be ready for the Tenderfoot, Second Class or even First Class SMC. Please take a look at what you need and come prepared to complete those missing requirements that you might be lacking. I know of a few scouts that are only missing the Fitness test for Tenderfoot. Please fill out that exercise tracker and wear running shoes if you need the second portion of that. ASMs, please show up in force ready to help scouts advance. The more adult leaders present then the more we can get done. Our next COH is on the 11th and it would be awesome to finish the year with a bunch of advancements!